Mumbai: Leading orthopaedic surgeon Dr Sanjay Desai has been nominated to receive the prestigious Dr Bidhan Chandra Roy National Award that recognises the best talents in development of specialities in different branches in medicine. The award will be presented to Dr Desai by Hon’ble President of India Shri Ramnath Kovind in New Delhi. The award was bestowed upon Dr Desai for his noteworthy work done in the orthopaedic field and for developing a subspecialty and taking it to an international level. Dr B. C. Roy Award was instituted in 1962 in memory of Dr Bidhan Chandra Roy by Medical Council of India and is the highest medical honour of India. Dr Desai, who is a Super Specialist in the shoulder and knee Arthroscopic Surgery at Bhatia Hospital in Mumbai, is considered a pioneer in shoulder and knee surgeries in India and has been consulted by several celebrities including Shahrukh Khan, Hrithik Roshan, Sharad Pawar and Sonia Gandhi. He has been practising in the highly specialized field of shoulder and knee surgery since the last decade and is credited with bringing world-class arthroscopic shoulder surgery to India. With shoulder surgery being a relatively young speciality, patients like sportspersons were forced to travel abroad to undergo advanced shoulder surgery. Dr Desai’s expertise meant that this revolutionary surgical treatment was affordable and available to such patients in their own country. He is also the founder member of the Shoulder Society of India. Dr Desai holds a brilliant academic record throughout his orthopaedic career having won several laurels including a Gold Medal at the University of Liverpool, United Kingdom, scoring a second position in MS (Ortho), University of Bombay and winning the Khazanifar medal in MCh (Orth), University of Liverpool. 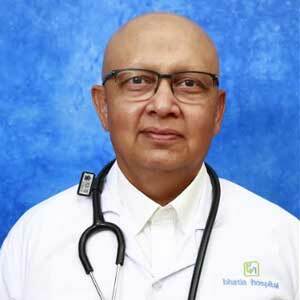 He is the recipient of several international awards like the ‘Young achievers Award – 2002’ conferred by the Indo-American society and Giants International Award in the field of medicine — 2016. He has been Referee of the prestigious Journal of Bone &amp; Joint Surgery, American Journal of Sports Medicine and is on the editorial board of the European Journal of Orthopaedic Surgery and Traumatology. Dr Desai has performed live demonstration surgery in several countries across the globe. He will soon have a book published in his name titled Romancing the Shoulder. congratulations.Dr. sanjay desai.you have already romanced with shoulders.bilkul right doctor .perfact award to you sir.Next we hope to listen PADMA………….best wishes.